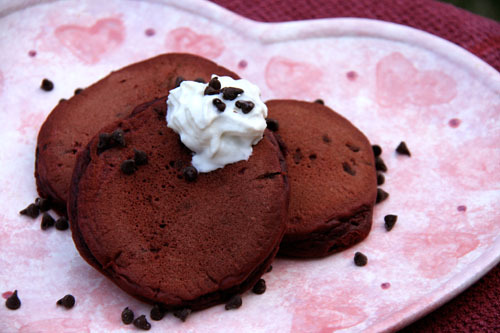 Can you think of a better way to start your Valentine’s Day morning than with rich, soft, chocolaty Red Velvet Pancakes?! I can’t either. They even get served with a luscious, cream cheese dipping sauce. Pretty sweet, right?— pun totally intended…that’s just how I roll. Seriously, these are absolutely decadent and for the handful of readers I have from the Los Angeles area, they are a dead ringer for the ones served from L.A.’s famous Buttermilk food truck. I have dreamt of these babies and craved them for days and now I can make them right in my own little kitchen…happy, happy me and now happy, happy you! Valentine’s Day can be controversial at best. Singles feel left out and married couples, ones strapped down by kids, mortgages, pets and jobs are sometimes too overwhelmed to celebrate. Many people claim that they just don’t want to give in to the commercial marketing world who tells us that this is the day we must buy cards, flowers, chocolates and jewelry. But I say this, why NOT celebrate a day that is entirely devoted to love and good relationships? There are no rules about how you must celebrate it, and anything that makes your better half feel appreciated and loved can’t be bad, right? A great relationship can only be strengthened, and a rocky one can possibly be a bit better. What’s to lose? My gifts to my spouse have often been from the kitchen. I know this shocks you. I have been known to bake huge batches of heart-shaped chocolate chip cookies with plain milk chocolate chips (HIS chocolate of choice, not mine) and totally nut-free (he is of the no nut persuasion—that just sounds wrong, doesn’t it?). I even like to do a few nice things for my kids on Valentine’s Day. They might not be the romantic love of my life, but they are two of my greatest loves and reminding them of that is ALWAYS a good thing. Living life with teens and kids can be tumultuous, crazy and sometimes fraught with angst. So why not take one day to take a break from the negative and celebrate the positive—love! Start with serving these babies for breakfast and their school day will start off with a crazy bang (you may not want to tell their teachers that you just sugared them up and sent them on their way)! Maybe, in addition, you could throw a few heart-shaped candies into their sack lunches. I, corny mom that I am, have been known to cut their sandwiches with heart-shaped cookie cutters on Valentine’s Day when they were little. A sweet way to surprise them in their lunch then, but now I would just be the most embarrassing mom on the planet since they are in high school and college. Instead, I sent my son off to college with chocolate chip cookies and candy. Finally, if you are a party of one this V-day and enjoy children, my recommendation to you is to offer to babysit someone’s kids for a couple of hours on Valentine’s Day (yes, I am crazy, but it’s just a thought). Bring some break apart cookie dough and a movie, and you will be loved right then and there by two grateful parents who are spread thin and in desperate need of some reprieve. Just as a bonus, you may feel a little better about being responsible for just yourself when you leave behind the mess and whining children and know that you are coming home to a nice quiet place where wine is ample and the movies are Disney-free. Sometimes, just thinking of someone else outside ourselves actually brings us the greatest joy. So if you are totally down and out at this big, romantic holiday, think about someone who needs you and help out in any way that suits you. There are so many in need at this moment. Either way, celebrating or not, I can’t seen any reason in the world you wouldn’t want to start the day with these beautiful and RED pancakes. Serve them along side some scrambled eggs, with fresh strawberries on top and the breakfast will possibly be a bit more balanced. —My recommendation is to mix the dry ingredients together in a mixing bowl the night before, leave it out on the counter and cover it. That way, in the morning, you can throw it together in lightning speed. This recipe makes about one dozen three inch pancakes or about two dozen minis. 4oz. of cream cheese, room temp. 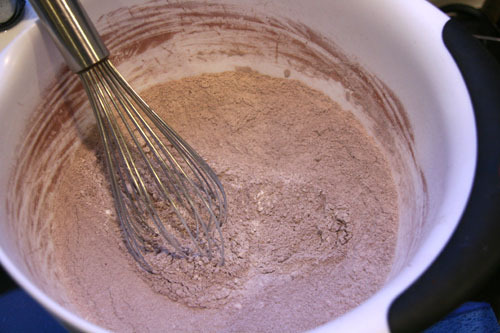 To make the pancakes: Combine your dry ingredients in a large mixing bowl, flour through cocoa powder. Gently whisk the dry ingredients to eliminate the need for sifting. Pour buttermilk, oil and melted butter into a medium sized bowl, and add two cracked eggs. Lightly whisk the eggs in with the wet ingredients. Pour the wet ingredients into the dry ingredients and incorporate using a rubber spatula. 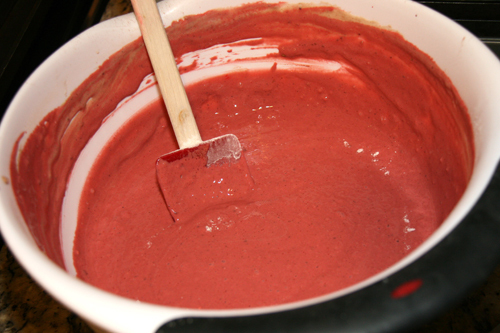 Your batter may be a bit thick at this point, but adding the dye tends to thin it out enough to ladle. Do not over mix as this leads to tough pancakes. 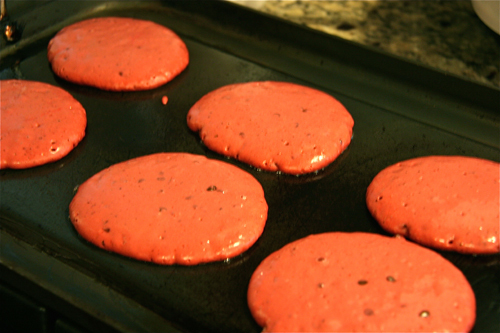 Before adding the coloring paste or gel, prepare your griddle so it is nice and hot when you are ready to cook them. Melt a pat of butter and a tablespoon of canola oil on your griddle. Turn your burner on medium and use a wooden spoon or paper towel (I trust you not to catch the paper towel on fire—albeit this is NOT the safest way to grease your pan) to spread the oil and butter over the pan, greasing it. The butter browns the pancakes and the oil keeps them from sticking. Let your pan continue to get hot on Medium or Medium-High heat. A nice hot griddle will help cook your pancakes through and give you a fluffy inside but a slightly crisp outside. Add the red coloring paste a little at a time with a toothpick or drop by drop if you are using liquid coloring gel and mix with a rubber spatula until the color is just barely red. Coloring paste stains your hands easily so handle the paste with care. Add the chocolate chips and combine with batter. A splash more of the milk (literally just 1 T. or less) will thin out your batter if yours is too thick to ladle onto the griddle. For fluffy pancakes don’t over mix. Ladle the pancake batter onto the hot griddle and turn the griddle down to a low medium now so it cooks all the way through. Flip the pancake when it begins to bubble slightly and the edges look firm. Finish cooking the batter another minute or until you peek and it looks done. For the dipping sauce, simply throw the cream cheese, butter and powdered sugar into your stand mixer and whip or cream together in a bowl or even simpler, do it by hand…it’s not difficult if you let your cream cheese and butter stand out at room temperature first. 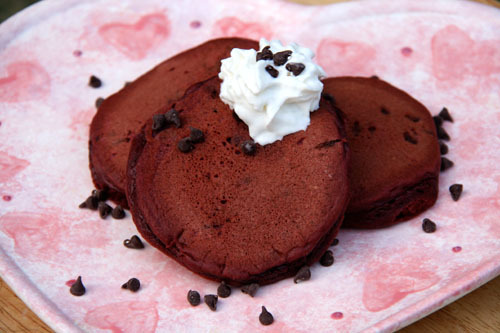 Categories: Bread, Breakfast, Chocolate, Valentine's Day | Tags: chocoalte pancakes, Red Velvet Pancakes, Valentine's Day breakfast | Permalink. Oh wow these sound fantastic! Thanks for sharing! Just want to dive in and take a huge bite!!! That’s so great to know! Thanks for the feedback. Have a great weekend! That is a fun way to start the day! What a fabulous idea! Happy valentines day to you. Reblogged this on XXMOOPOINKOINK ♥. Reblogged this on Awaluddin . These are just wonderful. What fun to make and eat for any day, and especially Valentine’s Day. I hope you all had a great one.